It’s not a budget problem, it’s a distribution problem! Why we continue to demand that the University of MN CHOP FROM THE TOP! As students return to the University of Minnesota for the spring semester, we return to the university amidst a shroud of humiliating national revelations of our universities shameful misconduct over the past decade. Months of research by the Wall Street Journal revealed in it’s article titled, “Deans List: Hiring Spree Fattens College Bureaucracy – And Tuition,” demonstrated without a doubt years of corrupt mismanagement by university administration. As a consequence state politicians in St. Paul have been demanding accountability via a comprehensive third party budget review of the university. Tuition paying students upon reviewing this article will find themselves faced with the fact that their tuition at the University of Minnesota has not only sharply risen over the past decade, but that is amongst the most expensive of public institutions in the country. Students may then ask: what has this money gone to pay for? Not the massive building projects across campus, nor hiring exceptional staff and faculty and certainly not to providing students with improved campus resources. The fact is that our tuition has soared to these outrageous heights due to administrative mismanagement, corruption and greed. Students must not only take the time to research these revelations, which make it clear that our tuition is in fact paying very little for our education, but rather we pay for an administration that numbers 3.5 staff to every student. Students who will graduate with more debt then ever before, even those having worked upward of 30 to 40 hours a week, must then make a choice, to simply accept this burden of debt or to demand accountability of its administration. Tuition has doubled over the past decade, vastly exceeding the national averages, while administration has grown by 37% and while at the same time staff and faculty levels are being reduced and programs are cut. While President Kahler and his administration point to reductions in state funding they rarely will point out a simultaneous increase in alumni and corporate donors to the university. What President Kahler and his peers have failed to provide students or the state is a comprehensive public budget for review. The authors of the Wall Street Journal article found themselves shocked at the difficulty of finding any kind of comprehensive budget. Before the end of the fall semester, an article titled, “Money Woes Impact Academics,” ran in the Minnesota Daily noted how many students were struggling to buy books necessary for class, pay rent or even eat on a daily basis. The article demonstrates the struggles of students while attending the university. The financial burdens rarely cease after graduation though. According to studies from Rutgers University graduates can expect between 7-12% unemployment, while 49% will not have full time work and 43% will be underemployed in jobs that do not require their level of education. The average salary of a 2011 graduate was $27,000 a year while the average graduate in Minnesota can expect $29,800 in debt, the third highest in the nation and an increase of 28% since 2005. Students struggle to pay their bills, eat and perform at a high level academically while at the university. We also graduate with few prospects of paying off the massive debts we incur. These troubling points bring us back to the question of what are we paying for? Since President Kahler claimed in his March 18 2012 letter in the Star Tribune that he would, “make every discussion with a single focus in mind: what is best for students,” he has done little to demonstrate this. Rather than proposing a “freeze on tuition,” under the conditions that the state increase funding to the university, what President Kahler should be doing is offering a 37% cut in administration, a return of the 40% increase in tuition that was thrust upon students to pay those administrators in return for a maintenance in current levels of state funding. When President Kahler has to skip meals, can’t pay rent on his free East Cliff mansion and cannot afford to pay for his books, only then will he begin to relate to student needs. Students at the University of Minnesota must begin to organize in response to these revelations in order to begin challenging President Kahler and his administration to not only be accountable to students but to begin serving the students that are paying their bloated salaries. 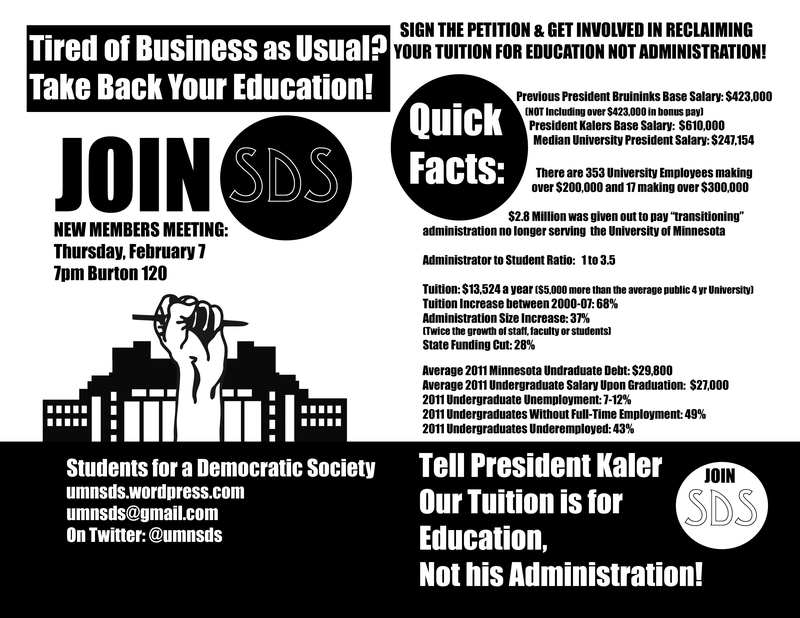 Students for A Democratic Society at the University of Minnesota has long been advocating for students rights and working against corrupt administrative practices and this spring is introducing a petition to students for a referendum on the All Campus Elections in April. This referendum is intended to serve students now and in the future at the University of Minnesota in three ways. First, it will demand the releasing of an annual comprehensive budget of the university for students to review before it is presented to the legislature. Second, it demands a cut in the size and scope administration in order to reinvest in education and not administration. Finally it will serve students by requiring any future increase in tuition to be introduced to students who would then have to vote in favor of such increases. This voting, in addition to the release of a comprehensive budget, would act as a mechanism for future administrative accountability and protection for students tuition money against waste and mismanagement. Students must demand accountability that every dollar paid for education serves their education, not the administration. In the coming semester we will be encouraging students to sign our petition, engage in educational events and forums as well as to challenge the University of Minnesota administration to be more accountable to the students they claim to serve. 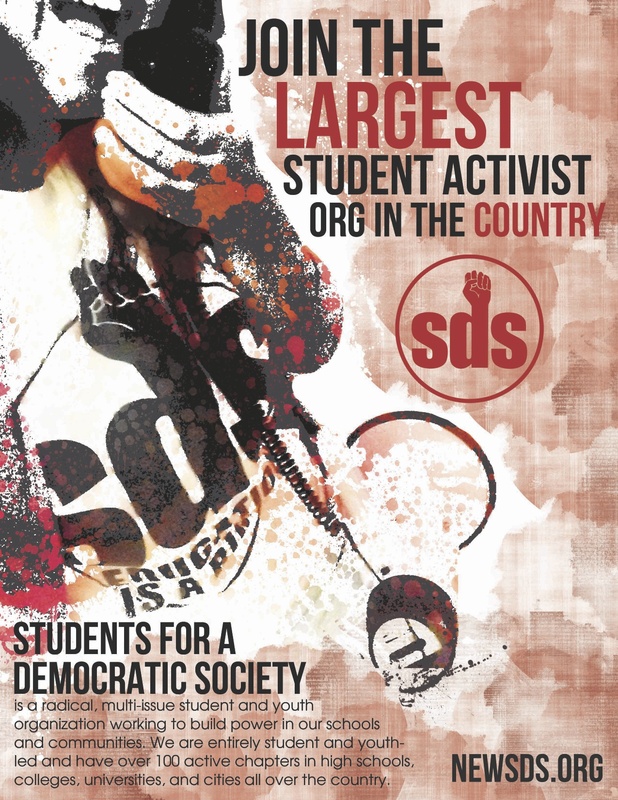 Interested in joining SDS? Come to our new members meeting to get to know our group and learn about our plans for this semester, including our annual spring rally for education rights!